Munak, a small human settlement in Karnal district of Haryana, has lent its name to an engineering structure (Munak head) on the nearby Western Yamuna Canal (WYC). The Munak “head”, enables downstream distribution of water from the main WYC into its sub-canals. One such sub-canal currently conveys Delhi’s share of the Yamuna waters. Facing water crunch, Delhi financed the concrete lining of an old abandoned sub-canal, now popularly called the “Munak Canal”, hoping that since concretisation would prevent seepage losses, the city would stand to gain in terms of the net supply of water received by it through the said freshly-lined canal. Haryana contests this understanding and hence the claims and counter claims have resulted in an unfortunate litigation. This, as explained below, need not be. 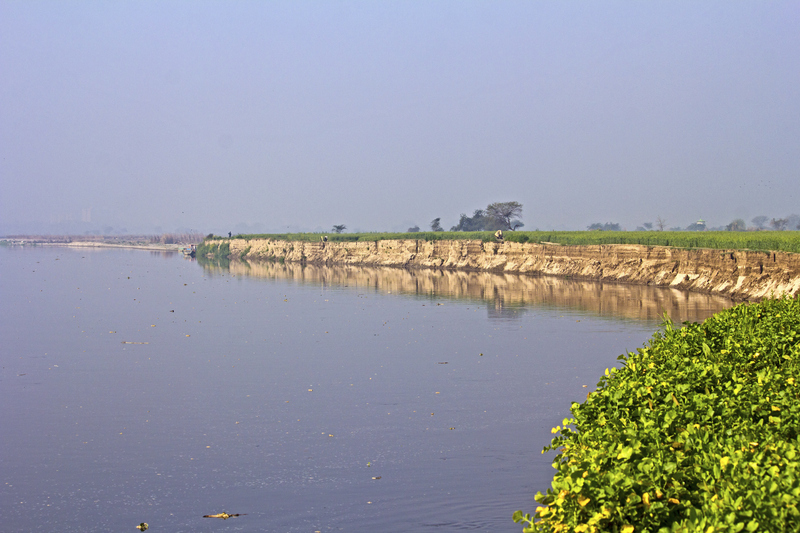 The Western Yamuna Canal originates from a barrage on River Yamuna at a place called Hathnikund, about 230 km upstream of Delhi. It carries water meant for use in Haryana and in Delhi and travels 260 km before reaching the national capital territory of Delhi. Interestingly, it runs almost parallel to the river through Haryana’s districts of Yamunanagar, Karnal, Panipat and Sonepat. It clearly makes little sense for the water that the river was naturally carrying, to be diverted into a parallel canal to reach the same destination (Delhi in this case). It is this logic that suggests a possible solution to the unsavoury inter-state imbroglio over Yamuna water sharing. Delhi is entitled to about 1,000 cusec (500 millions of gallons per day or MGD) of water currently conveyed through the WYC. Of this, some 800 cusec (400 MGD) is Delhi’s share in the Yamuna waters and 200 cusec (100 MGD) in Sutlej waters provided through the Bhakra canal system and transported through WYC. 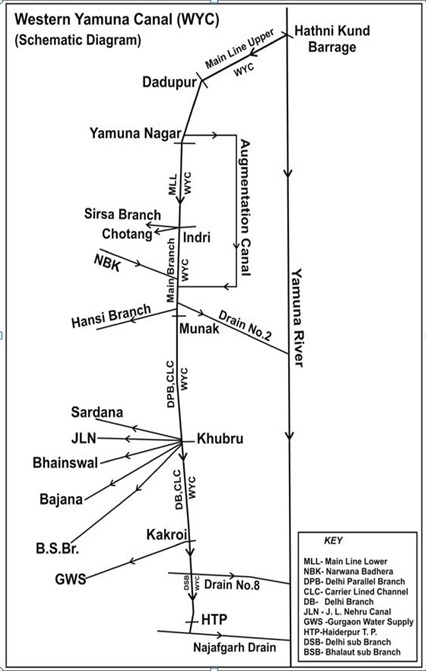 It may be noted that Haryana, at Karnal, receives about 1,500 to 2,000 cusec (750 – 1,000 MGD) of Sutlej water into the Western Yamuna Canal (WYC) through the Narwana Branch Link canal. It is suggested that Delhi’s share of the Yamuna waters should flow in the river, to be collected by Delhi at Palla (first village on the banks of river in the national capital territory of Delhi) or thereafter rather than being diverted from the river at Hathnikund in Haryana. Also, Delhi should surrender its 200 cusec interest in the Sutlej waters, in exchange of equal Yamuna waters in the river. This means that Haryana, which controls the barrage at Hathnikund, would let requisite water flow in the river for Delhi to access around 1,000 cusec (500 MGD) of its share from the river. Sutlej-Yamuna water swap by Delhi also makes sense as it would prevent Delhi’s share of Sutlej water from travelling long distance with concomitant seepage and evaporation-related losses en route to Delhi, while Haryana could gainfully use this water (and save water that is lost during seepage) in its western districts. It is a travesty that presently, portions of Yamuna water (500 cusec) is made to flow through the WYC to be put back via Drain No 8 into the river at Palla for use at the Wazirabad and Chandrawal water works. While the above shall certainly involve engineering challenges of accessing and conveying water lifted from the river to the concerned water treatment plants (Haiderpur in particular), this arrangement shall be win-win in all other respects. Firstly, Delhi shall be able to receive and manage its own share in the Yamuna and Sutlej waters, avoiding frequent hassles with the upstream state of Haryana. Secondly, the quality of water received through the river than through the canal would be superior in terms of its mineral content and wholesomeness. Moreover, the two upstream states of Haryana and Uttar Pradesh would benefit through regular recharge of their ground water, courtesy the once again flowing river. And the river would regain its unfortunately lost “perennial” status. Will the Yamuna clean-up go the Ganga way? Why is river Yamuna still maily?